I got my lab results back yesterday. Negative for H. Pylori, normal metabolic panel (though she said my carbon dioxide was a little low; I’m not sure how that’s even possible or what impact it has on the human body). 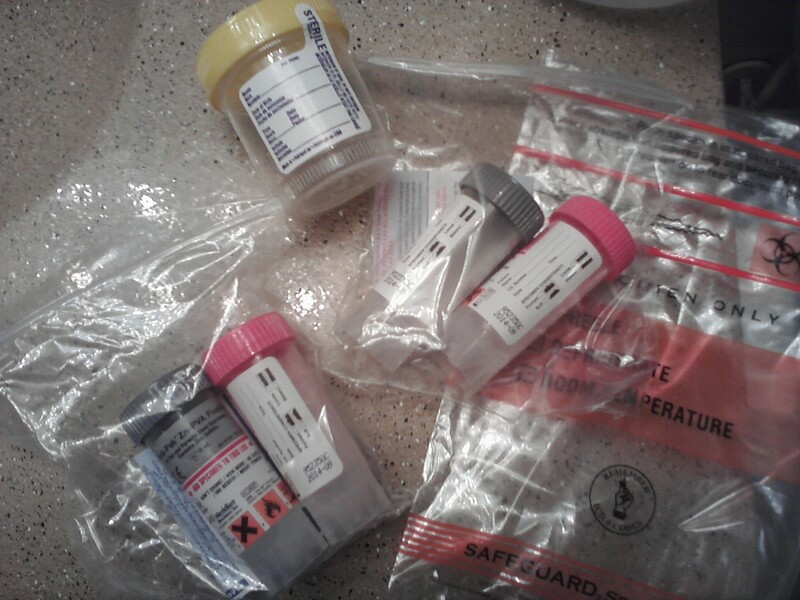 Since I’m still on a diet of 90% liquids and still alternating between diarrhea and constipation, the doc had me do ANOTHER stool sample so they can test me for even more things. Since all of this result sharing happened over the phone, I had to leave work a few minutes early and stop by the lab to pick up a specimen cup. And this is what they gave me. It was really difficult not to do more than stare incredulously at the lab tech. I had expected another little white plastic tub like I got from the doctor’s office last week. (How I was even supposed to accomplish that considering we’re in the constipated part of the cycle was beyond me.) I know she said they were testing me for more stuff this time, but this was ridiculous. Apparently, I was supposed to poop not just in a cup, but in all the cups. Tubes. Things. All the things. I had to poop in all the things! This sure as hell better be worth it. I mean, I’d better have the parasite to end all parasites or something. Because if these tests are inconclusive, too, I just might scream. This entry was posted in Gluten Free, Musings and tagged Health, humor, humour. Bookmark the permalink.